Are you hosting a holiday gathering this year? Whether it is a potluck office party at work, an appetizers and cocktails party with friends, or you just need something to nibble on after all that gift opening this cheeseball fits the bill. 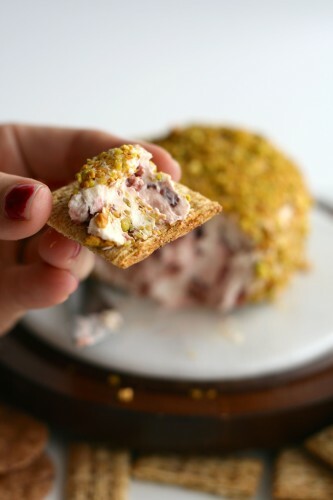 I like to think it is quite festive getting the red from the dried cranberries and the green from the pistachios. 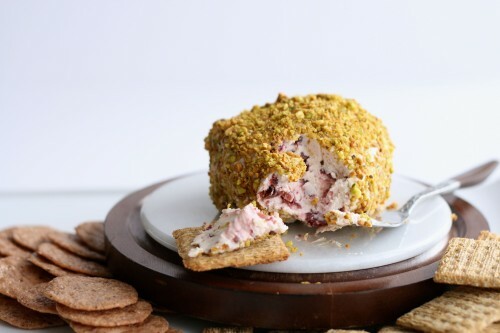 If you are feeling extra fancy roll this into individual bite-sized balls instead of one large cheeseball.Â The tart dried cranberries paired well the honey sweetened tangy goat cheese is a match made on a cracker. Mmmm, goat cheese how I love thee. 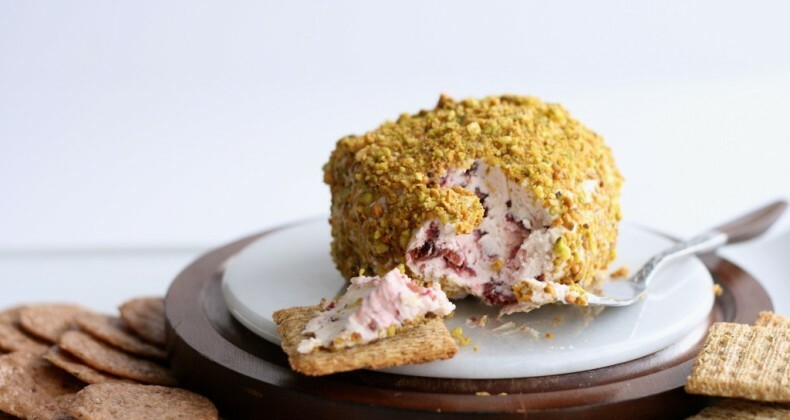 Tip: you can make this cheeseball in advance, wrap it in plastic wrap, pop it in the freezer until 24 hours before you want to use it, then transfer to the fridge to thaw. I didn’t notice any deterioration of quality when I saved one to serve for Thanksgiving. Pour chopped pistachios into a bowl. 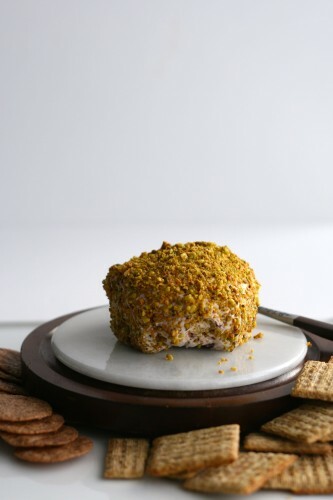 Remove plastic wrap from cheeseball and press cheeseball into chopped pistachios, turning to coat. I love cheese balls. I make a few every year around this time. This year I was thinking of having it look like a snowman. I haven’t decided. It would take up more room, and it’s covered in chopped walnuts (more brown from the nuts than white) anyhow. The snowman would be so cute! I love festive food. Your cheese ball sounds terrific and I like the idea that it can be frozen. It comes in handy that it can be made ahead.